Katie Robinson, a postdoctoral fellow at the LPI-JSC Center for Lunar Science and Exploration and a co-author of the new study, said sample 14321 has been recognised as being unusual for a long time—and only now are we appreciating how unusual it really is. Packed within this lunar breccia is a 2-gram felsite clast—fine-grained volcanic rock—containing felsite fragments, including quartz, feldspar, and zircon. These materials are commonly found on Earth, but are very uncommon on the Moon. 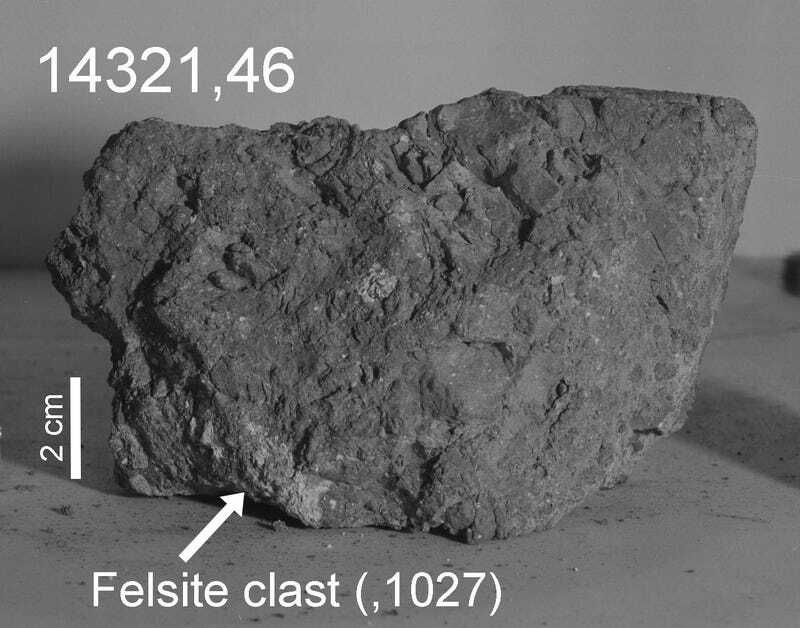 And indeed, a chemical analysis of the sample suggests it formed under terrestrial, rather than lunar, conditions. 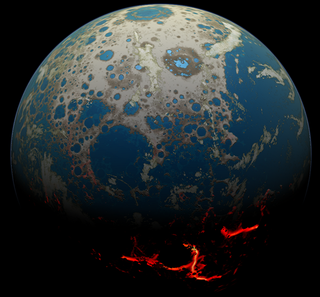 Obviously, the Moon just happened to have an Earth-like environment next door in the form of the Earth. That an ancient asteroid strike could have thrown chunks of terrestrial debris into space and onto the Moon’s surface is not a ridiculous idea. Back during the Hadean, asteroids regularly produced craters thousands of kilometres in diameter. Impacts of this magnitude were capable of pulling out materials from deep within the Earth’s surface. The apparent terrestrial fragment found within Big Bertha formed around 20 kilometres (12 miles) below the Earth’s surface—a depth not out of reach for these ancient asteroids. Another possibility, according to the new research, is that the fragment crystallised on the Moon. But for this to happen, the material had to have formed deep within the Moon near its lunar mantle, and there’s no good reason for it to reach the surface. The simpler explanation, the researchers said, is that it came from Earth. Speaking of the lunar surface, it seems surprising that the Apollo astronauts were able to find this breccia so easily. Indeed, billions of years of steadily accumulating lunar dust, known as regolith, should have obscured traces of this rock. But as Robinson explained, Big Bertha was covered in regolith, just not enough to bury it completely. To explain its presence on the lunar surface, she said the breccia was once buried, but it returned to the surface following an impact that formed Cone Crater, a 1,000-foot (300-metre) crater near the Apollo 14 landing site—a “very common process on the Moon,” she added.